Mia Wasikowska and Michael Fassbender star in the romantic drama based on Charlotte Brontë’s classic novel, from acclaimed director Cary Fukunaga. In the story, Jane Eyre flees Thornfield House, where she works as a governess for wealthy Edward Rochester. As she reflects upon the people and emotions that have defined her, it is clear that the isolated and imposing residence – and Mr. Rochester’s coldness – have sorely tested the young woman’s resilience, forged years earlier when she was orphaned. She must now act decisively to secure her own future and come to terms with the past that haunts her – and the terrible secret that Mr. Rochester is hiding and that she has uncovered. Download Jane Eyre in Digital HD from the iTunes store. Jane Eyre images are © Focus Features. All Rights Reserved. Charlotte Bronte's classic novel has endured as a mainstay on many reading lists and has only been gaining in popularity. Since 1910, it has surprisingly produced 18 different film versions, not to mention 8 more adaptations for television. Over the years people, including my wife, have been eagerly awaiting a definitive version. This newest adaptation is directed by Cary Joji Fukunaga who is best known so far for his breakthrough debut, Sin Nombre. Hearing that makes one unsure if he is the right fit for such a project that is not only a period piece, but also an epic and beloved tale. However, upon further inspection, similarities arise. Both stories explore what it means to have a family, or lack thereof, while dealing with loss and the search for a better life. So in that respect, maybe Cary was perfectly suited after all to showcase this beautiful story. The novel, to which the film holds a firm but playful grasp, begins with Jane as a child who is orphaned and raised by her cruel aunt. She is sent away to Lowood, a boarding school where life continues to be harsh and strict. Her only consolation is another girl with whom she becomes best friends. Unfortunately, this too does not last, and when Jane is old enough to leave, she strikes off on her own to become a governess at Thornfield Hall. Here, her life improves significantly and she soon meets the master of this manor, Edward Rochester. Dark and impassioned, he becomes intrigued by Jane, and against formalities requests her presence often. Jane privately falls in love with him, all the while believing there is no chance he would ever return the affection. At this isolated and imposing estate, Jane soon learns there is more than meets the eye, and when she discovers Rochester's closely guarded secret, her life is turned upside down, and she flees into the unknown. She finally ends up at the house of the family Rivers, where the three siblings take her in and find her a job. Years go by as she desperately tries to forget Rochester but her longing heart cannot be quieted. Over the mysterious moor, she hears him calling her name and driven by her inextinguishable love, she searches him out. Since the story of Jane Eyre has been around long enough to be in the public domain, I credit the screenwriter, Moira Buffini, with infusing this old story with so much freshness and life. The basic story of where she came from and who she becomes is necessary to set a foundation, but it's not where the excitement comes from. 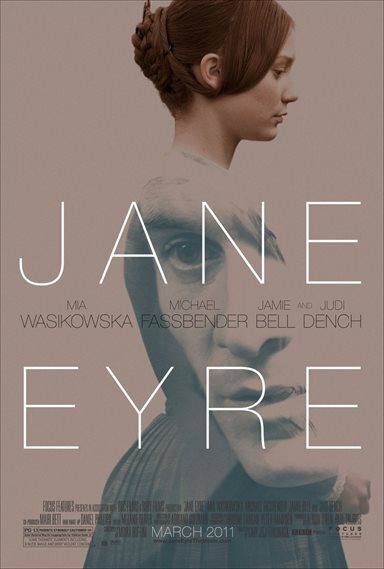 The real story begins when Jane, played by Mia Wasikowska from the new Alice in Wonderland, gets to Thornfield and ultimately meets Rochester, who is masterfully played by Michael Fassbender (from Inglourious Basterds and coming soon in X-Men: First Class). While this story has various themes, it has love at its core, and it's too easy for a romantic drama that spans so much time to get carried away with the grandeur of an epic (i.e. The English Patient). Yet Buffini knew exactly what to keep from the book and what to edit down, keeping the story from becoming convoluted or stagnant. In a stroke of brilliance, Buffini starts the film in the middle when Jane flees Thornfield. We then see her bleak childhood as a series of flashbacks instead of a melancholy first act. This also allows the viewer the chance to know all the characters up front, including and especially the Rivers siblings who come in at the third act, when an audience doesn't necessarily want to meet new people. With this vivid new beginning, you first see the tension and fear that Jane exhibits as she runs, and after seeing the situation second time around in the movie, you can feel it with her. Surprisingly this movie is very reminiscent of another classic tale, Alfred Hitchcock's Rebecca. Those of you familiar with this best picture winner will have a bit of a spoiler for Jane Eyre, but here goes anyway. Both movies feature a young woman who is supposedly plain and ordinary, and therefore doesn't think anyone could ever love her. Along comes a dashing, experienced older man who is bored with vapid, beautiful women and cannot resist this young creature with an otherworldly presence about her. Both stories have their version of an obstacle in a sinister secret that threatens their fragile relationship. Interestingly, both estates contain this threat, leaving only one possible ending if the two soul mates can ever be together. Where Jane Eyre differs is the focus, this title character has a future (with or without Rochester), while Rebecca's title character is in the past. We know the strength of Jane because of our journey through her life, so we are more invested in her character. The location that was chosen for the film couldn't have been more perfect. There was once a private house in that specific area of Derbyshire in England that is thought to have inspired Bronte in writing about Thornfield, and the filmmakers were able to take advantage of the natural yet impressive surrounding landscapes. All of the atmosphere worked easily into Cary's idea of bringing out a gothic tone in the film. The novel describes the ominous and haunting look of Thornfield and they were able to capture all the mystery that the manor was shrouded in. There was an interesting supporting role of Mrs. Fairfax, the housekeeper of Thornfield, played by Judi Dench. Normally we are accustomed to seeing her in dominant roles of power or control, whether playing M from the James Bond series or the queen of England. So, to see her in a position where she was being ordered about is contrary to what we know of her. I'm not sure if this was faulty casting or if the filmmakers were trying to bring a sense of dignity to the role of the Mrs. Fairfax, the housekeeper who was alluded to being a distant relative to Rochester. Either way it was odd at first, but still a pleasure to watch. After seeing Michael Fassbender in Hunger and Centurion, I knew he could magnificently carry a film. Now it seems he has cemented a place to stay, and is definitely the upcoming actor to watch. The scenes he had with Mia, and specifically the dialogue involved, were so poignant since there were only few moments the two had to convey their emotion. Mia in her own right played the "manic pixie dream girl" well as the inspiration to lift Rochester out of the depths and into the light. My wife loved this film immensely, and if you couldn't tell, while I am not its target audience, I loved it too. The care taken over each aspect, each shot, each detail made it easy to fall for. It was vivid, beautiful and complex, like the story and even Jane herself. Such tales can be trite and over told, and it has been so long since we've seen romance on the screen. It takes us going back to the classics to remember what we've forgotten, the power that comes with love. In the end, you understand the need that both characters had for each other, and the only home they longed for was fulfilled in one another.